An old time favorite the Butterfly bush reliably flowers through out the summer. Reaching heights from 4ft. to 8ft. (depending on variety) this hardy shrub is worthy of your flower garden. The Butterfly bush attracts not only butterflies it also catches the attention humming birds too. Deer dislike the flavor of this woody shrub so it is safe to plant in the Hudson Valley region. 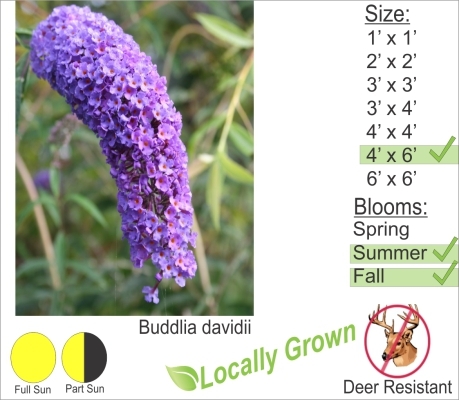 Butterfly bush likes well draining non-compacted organic soils like most other plants. Plant in full sun for the most blooms and part sun is OK too.